Tenant has not paid the rent in months, your property may be trashed, and you haven’t had to deal with evicting a tenant before. Don't waste anymore time allowing them to live for free. What do you do? Hire Empire Property Management Group, we have extensive experience in “rescuing” landlords from tenants who aren’t paying their rent. An eviction in Columbia can be very expensive, very tedious in dealing with legal issues, and you’ll still be stuck with a lot of work when the tenant is evicted! This process can be very time consuming and resource intensive. How much does your Landlord Rescue Service cost? The cost for this service is a flat fee of $300 plus expenses for an eviction if it becomes necessary. 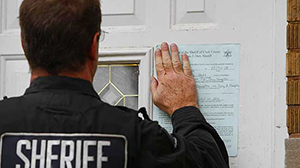 After a management agreement is signed, we will engage services on your behalf to pursue collections from a non-paying tenant, or to start the eviction. Expenses for simple evictions usually run $200 to $700, depending on how quickly the tenant vacates. In addition to a property management agreement, the owner agrees to participate in the Landlord Rescue program by allowing Empire Property Management Group to represent them in negotiations to correct or remove the current tenant. Owner agrees to pay $300 for the Landlord Rescue Program in addition to signing a property management agreement.